Dimensions 1.50 by 4.25 by 6.50 in. Otherland. In many ways it is humankind's most stunning achievement: a private, multidimensional universe built over two generations by the greatest minds of the twenty-first century. But this most exclusive of places is also one of the world's best kept secrets, created and controlled by an organization made up of the world's most powerful and ruthless individuals, a private cartel knownâto those who know of their existence at allâas The Grail Brotherhood. Though their purpose in creating Otherland is still a mystery, it may not remain so for long. For they have exacted a terrible price from humanity in the process, and even their highly organized global conspiracy cannot hide the nature of their crimes forever. And now a small band of adventurers has penetrated the veil of secrecy that prevents the uninitiated from entering Otherland. But having broken into the amazing worlds within worlds that make up this universe, they are trapped, unable to escape back to their own flesh-and-blood bodies in the real world. And as dangers and circumstances split their party into small, widely scattered groups, their only hope of reuniting lies in returning again and again to the River that flowsâin one form or anotherâthrough all the worlds. 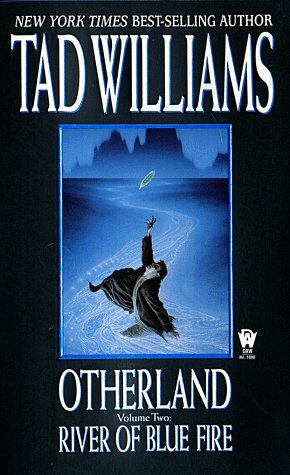 from Gardners Books (July 2, 1998); titled "Otherland River of Blue Fire"
About: Otherland, an incredibly complex and detailed virtual reality, has appeared.